Many of Bayreuth’s audience members can tell you about Ring cycles going back decades. They know the Ring very well. 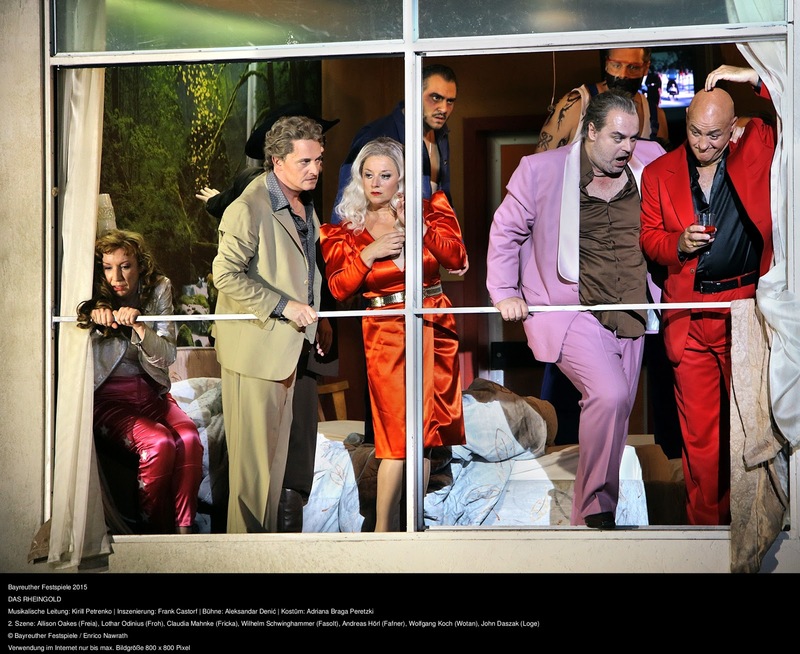 Not only that, but when we–and now I mean all of us–go to Bayreuth we engage with Wagner in a certain way: immersed, initiated, as part of a thread of history. We are here to contemplate, to chew over things. We see the Ring as a work whose meaning and presentation has changed through the decades, as works with life cycles and symbolic significance. And of course the works themselves construct their own, internal networks of meaning. The challenge of Frank Castorf’s Ring, now in its third year, is that it cannot be read in those terms. It rejects those premises. The more you ask what it “means,” the less you will see what it is. 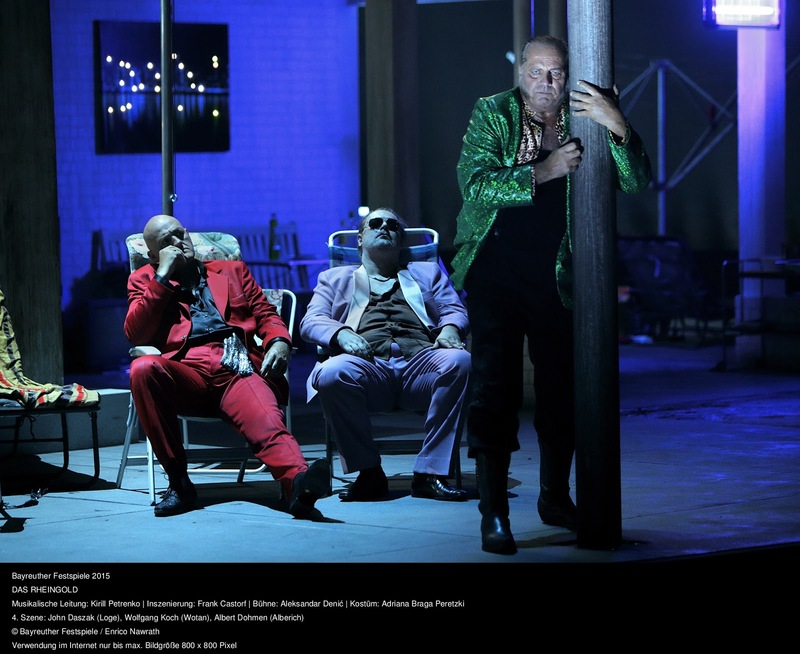 Here are a few thoughts on Rheingold. 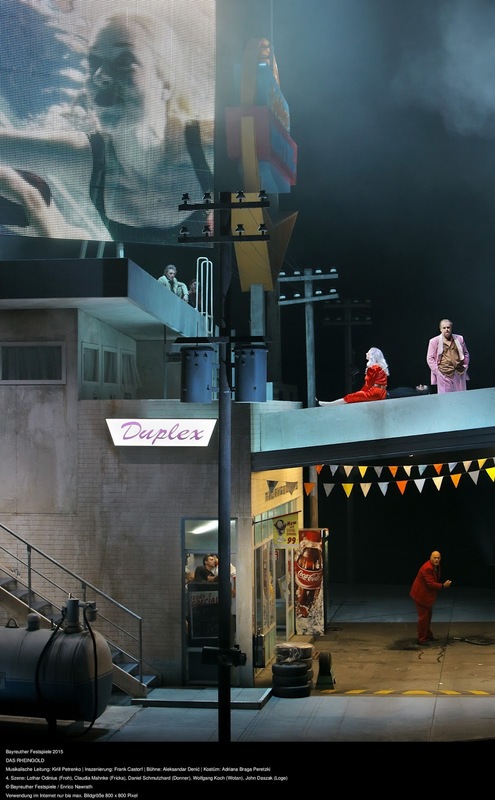 As many have already noted, Castorf was a strange choice to direct at Bayreuth. 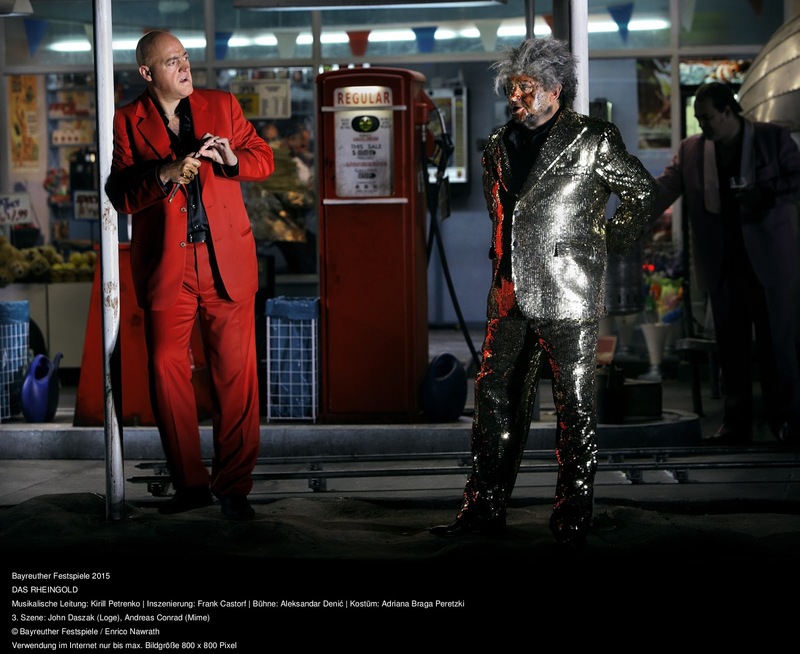 One of the greats of the German stage, his method involves slicing and dicing texts into mosaics of absurdist theater. Apparently he did this with Meistersinger at his home theater to considerable success. In Bayreuth, however, one does not chop. One starts at the beginning and goes until the end. Castorf doing a linear narrative is, in a basic sense, anti-Castorf. But considering all these caveats, it may be surprising for me to say that this Rheingold was actually very engaging, interesting, and even fascinating. (I have already seen Walküre as I am writing this and there is some trouble ahead, however.) First and foremost, however, this success was thanks to the musical performance. Bayreuth often gets a bad rap on this account, but I thought this was surprisingly excellent. In this acoustic, everything sounds transparent and light, with the words emerging clearly and the singers rarely resorting to yelling (or to the much-derided Bayreuth Bark). Credit first should first go to Kirill Petrenko, whose fleet, elegant conducting was often revelatory. If anything his balances tend to be rather string-heavy–though that could be the house at work. He takes his time at the revelation of the Rheingold and the Rainbow Bridge, even if the staging doesn’t acknowledge the pit (which it doesn’t). The orchestral texture is incredibly detailed but never overpowers the singers. He brings out the motives but not in an overly obvious way. If anything, it could use to be a little heavier in the approach of the giants, where the brass is not as mighty as usual. The staging has a kind of louche charm. 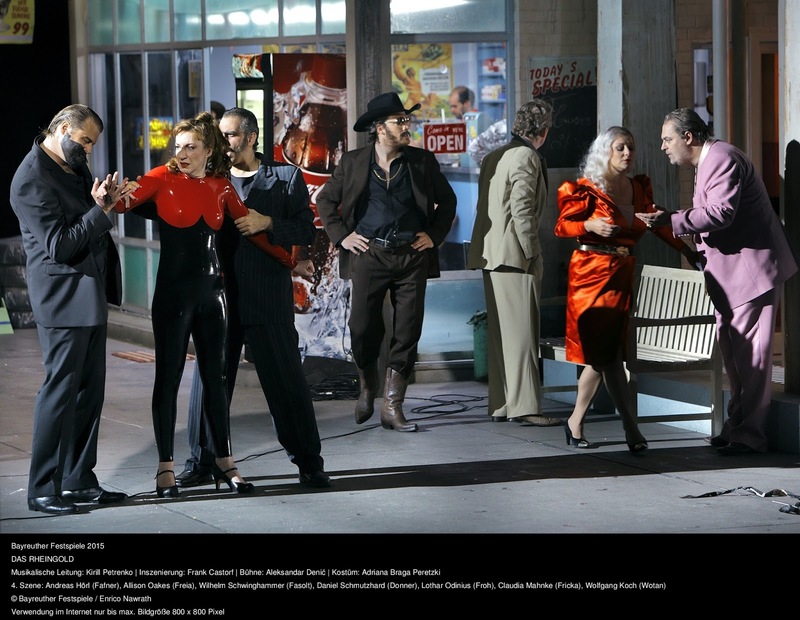 It all takes place in a run-down Texan motel full of the low-level gangsters of Tarantino or David Lynch (I thought first of Lynch’s Wild at Heart–which juxtaposes a similar landscape with Strauss’s “Im Abdendrot”!). The women are in shiny slips and robes with big hair, the men wear loud suits and sunglasses. Aleksandar Denic’s set is a marvel of detailed, scuzzy design. Mounted on a turntable, it has both exterior and interior spaces including a gas station, pool, porch, and several rooms. * A huge screen on the top of the building shows us much of the action in close-up, live, some from hidden cameras and some from visible cameramen. Some of this action we can see, some is taking place in places we cannot. Sometimes it will be the main focus of the action, sometimes it is apparently unrelated. It is a skewed vision. The second scene begins with Wotan, Fricka, and Freia all in bed together, but mostly the events are pointedly mundane. We spend a lot of time with the silent attendant of the motel’s gas station, a stalwart guy who is almost the evening’s secret protagonist. The result is a kind of Real Housewives of Valhalla situation, particularly considering the drama’s action. Technically, it is very impressively done. As a viewer, it takes some getting used to. Yet still, it is rather convincing and full of bright ideas, from Loge flicking his cigarette lighter in the direction of the gas station to the overall’ed contractor giants to, particularly, glittery, fur-wrapped matriarch Erda, sung by Nadine Weissmann, who exudes a glamorously world-weary air. 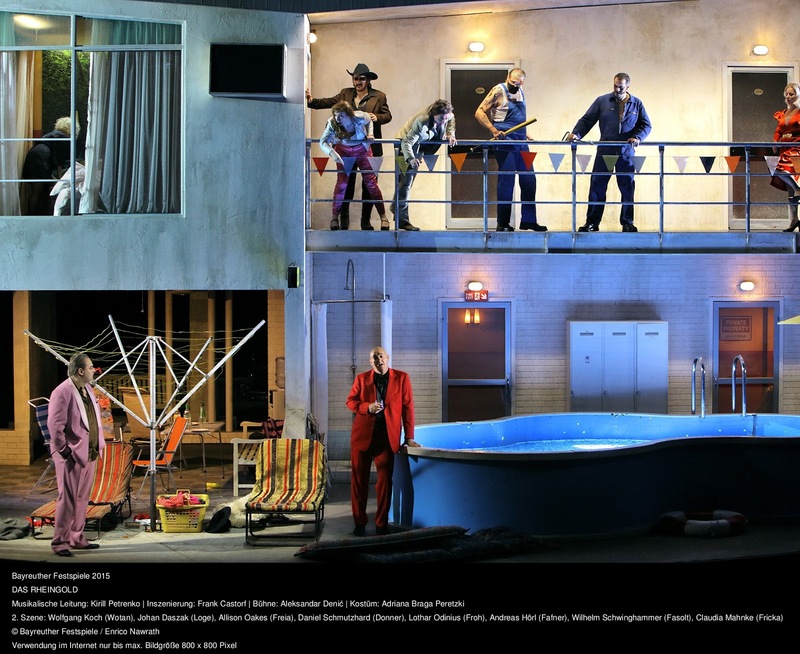 The sublime, however, has left the Festspielhaus, at least in the visual realm. It’s all ruthlessly petty. There is a lot of shady business going on. Castorf does not pause to let us enjoy the music and sometimes undercuts it, such as when Alberich throws a beach ball around as the Rhinemaidens exalt the gold. (Alberich also has a rubber duck.) 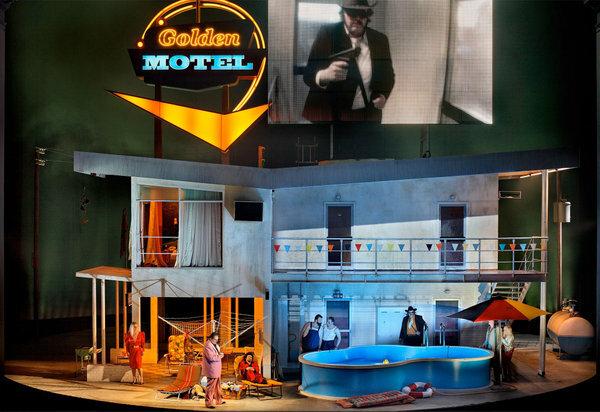 We never leave the hotel–the Rheingold is found in the motel’s pool, Nibelheim is an Airstream trailer, and the building of Valhalla just means that some signs light up. The narrative, however, happens–we hit the points we expect to hit. There is gold, there is a ring, and so on. The video helps with Alberich’s transformations. The difference is that they seem to have no consequence. Everything passes with equally lazy ease. Causality, pace, and drama are subordinate to atmosphere. Lots happens, but nothing matters. This is a cycle, I think, which does have a big idea, though it is inconsistently pursued. It is a simple idea, though: power corrupts. Power makes us all sleazy. The theme, in fact, as becomes clearer in the next installment and is already implied by the gas station, is oil. 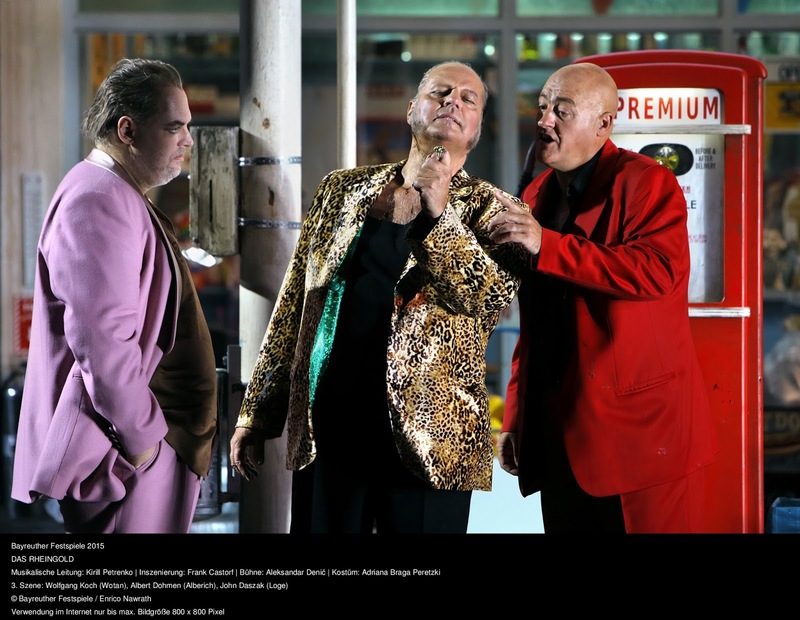 I am not sure if Petrenko’s luminous interpretation is really the right one for this production, but I don’t know what would be a preferable approach. He did get some excellent singing. As Wotan, Wolfgang Koch was solid, rich of tone, and rather musical, but never quite acquired any charisma. Perhaps in this staging this is intentional, but vocally there is also some last bit of depth missing, though he certainly has stamina. In contrast, Claudia Mahnke’s Fricka was urgent and commanding, sung with a woody, dark sound. John Daszak was a wry, entertaining Loge, though the voice is not very pretty. 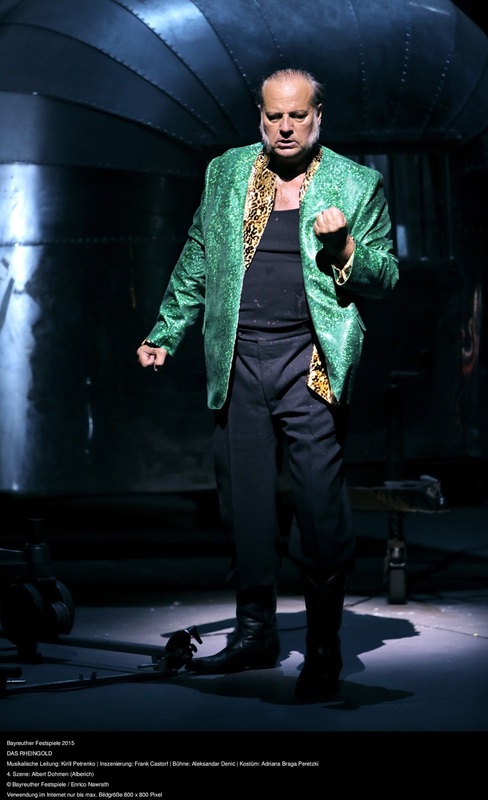 Albert Dohmen was fairly restrained as Alberich, considering the setting and look he had (C-list gangster), and while his voice sounds worn he knows his way around this music. The three Rhinemaidens were excellently balanced. While I have some trepidation about this Ring–rather more after having seen the Walküre, in fact, which I probably won’t have time to post about before Siegfried tonight, sorry–this installment seems to open some interesting doors. I am waiting to see how it develops over the rest of the week. *As an American, it was an uncanny valley of not-quite authenticity. It is on Route 66 in Texas, so why are they flying a Confederate flag? And who in Texas hangs their underwear outside to dry? This isn’t Naples. Great review. I look forward to the rest, especially after you own semi-spoliers on Twitter. On your final point, Texas *was* a Confederate state. More crucially, as current events show, display of the Confederate flag now demonstrates a state of mind, not limited to one region or even one country. Yes, but in my limited experience the Texas flag is way more popular than the Confederate flag, no? The only problem with this overload of minute detail is that it is otherwise internally consistent (though the time period is totally unclear) so things that feel slightly off are really jarring.